The integrated information system etour in cooperation with WebHotelier and third-party reservation systems (air tickets, ferry tickets, etc.) are providing a new service to create online and potentially a real dynamic package (Dynamic Packaging). Dynamic packages are provided by the application called «Package Deals» which is available both in B2C environment (Business To Consumer) for individual customers and internet users and in B2B environment (Business To Business) for partners and corporate clients. that wish to sell all kinds of their services (in association with third party services) as a part of packages with a dynamic configuration. 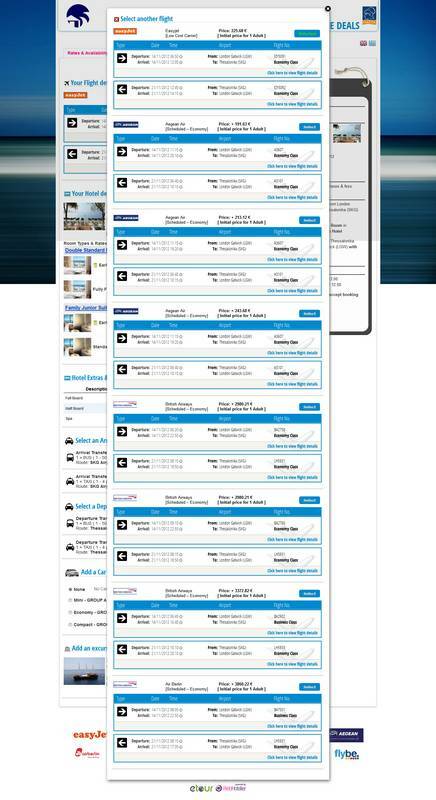 The application «Package Deals» collects information for all the possible choices of accommodation and itinerary (flight, ferry, etc.) on the basis of the desired destination and departure point. 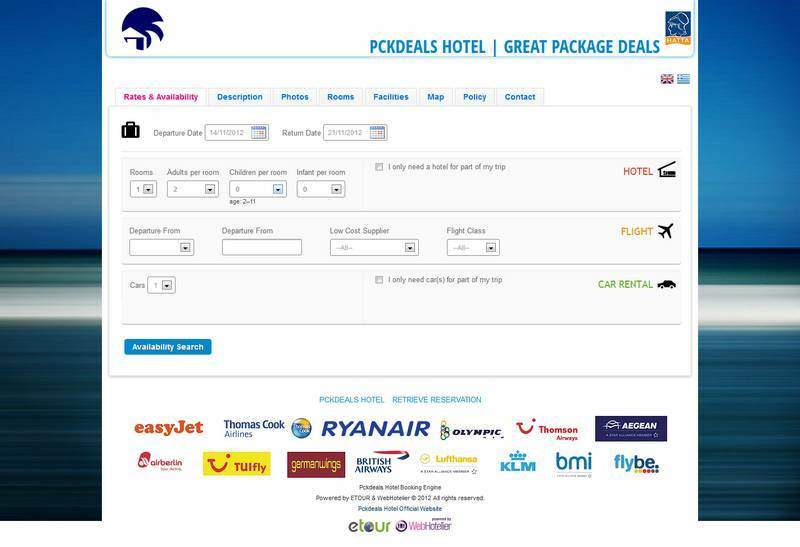 In particular, by collecting the information that results from specific hotels and flights (to and from specific destination) the application «Package Deals» automatically creates combinations and displays the corresponding offers for packages. Moreover some extras that are available from multiple vendors can be added and more services from all kinds of tourist services can be combined with the package providing it with more benefits and facilities. 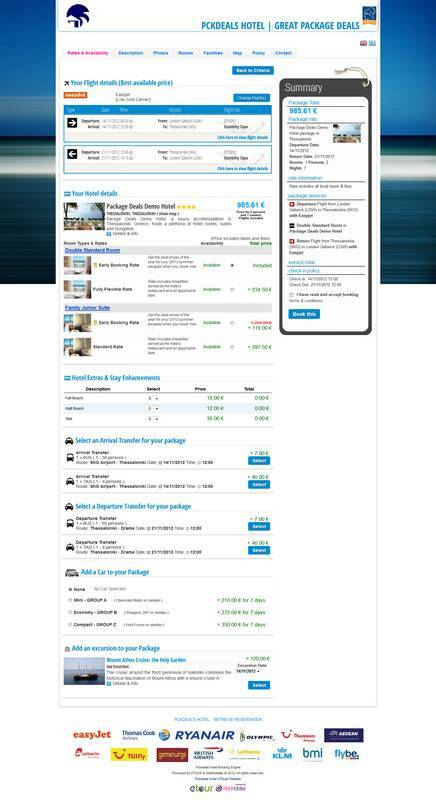 These additional services can be transfers, excursions, car rental, meals, travel insurance, etc. There is ability to manage the package during its setup and customize the package as each consumer desires. This customization enabled by changing the mandatory and the optional services package as well as the payment options. 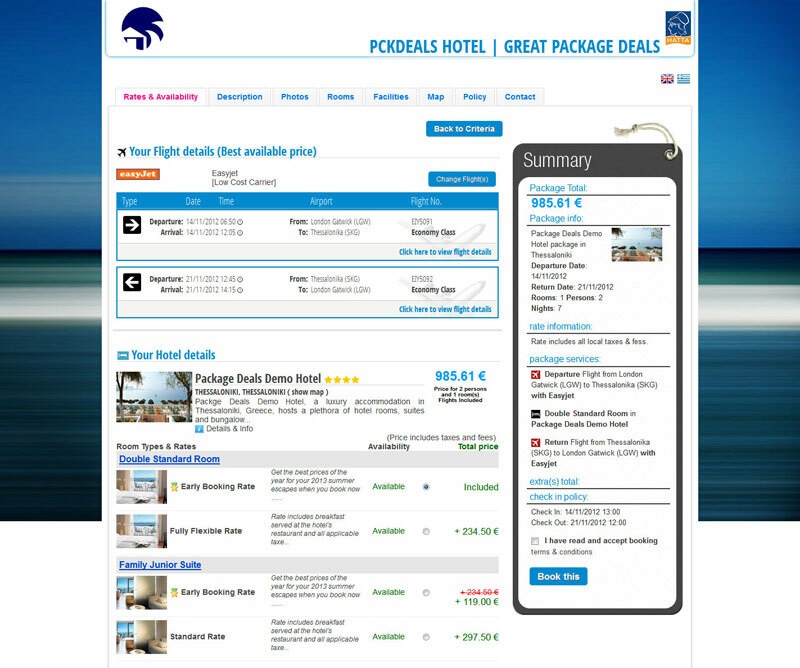 The application «Package Deals» can be fully interfaced with WebHotelier or webGDS, from where the application is supplied in real time with the accommodation by all the possible suppliers and the application is using this accommodation as a part of the package. 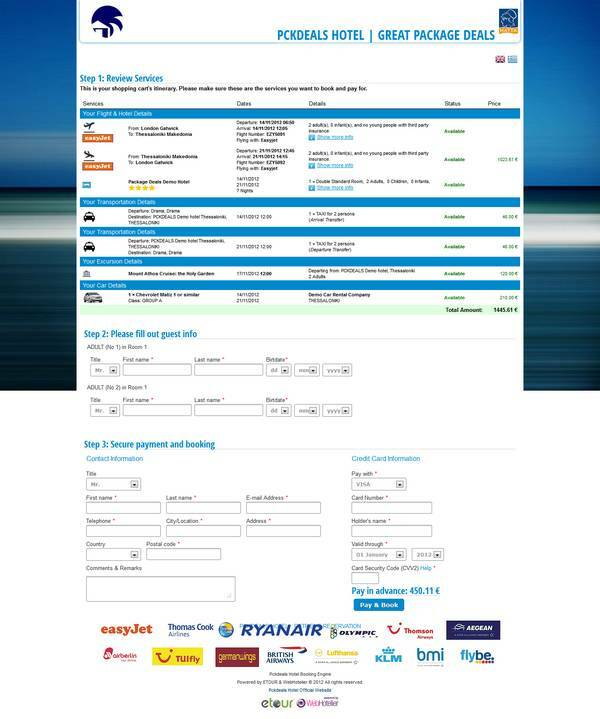 Furthermore the application «Package Deals» interfaces in real-time with systems with third party ticketing systems (airplane, ferry, etc.) from which the application can purchase from multiple vendors the air or ferry tickets for the routes, and use them as parts of the package. In this way is coming along a package, which consists of the dynamic combination of hotels and routes, in addition there are available additional etour tourist services to add extra, such as car rental, excursions, etc. Each package has information for the services included, description, photos and facilities of the hotel and descriptions and photos of the additional services. The application «Package Deals» offers an easy, friendly and multi language user’s interface that meets the requirements and standards, which allows Internet users to select quickly and easily the preferred services and create in just few steps the ideal tour package that will fully cover the needs. The application «Package Deals» moreover offers easy, quick and efficient setup and selection of the ideal package without any errors or delays, and presents quickly the results with all the available packages including a concise and complete description. 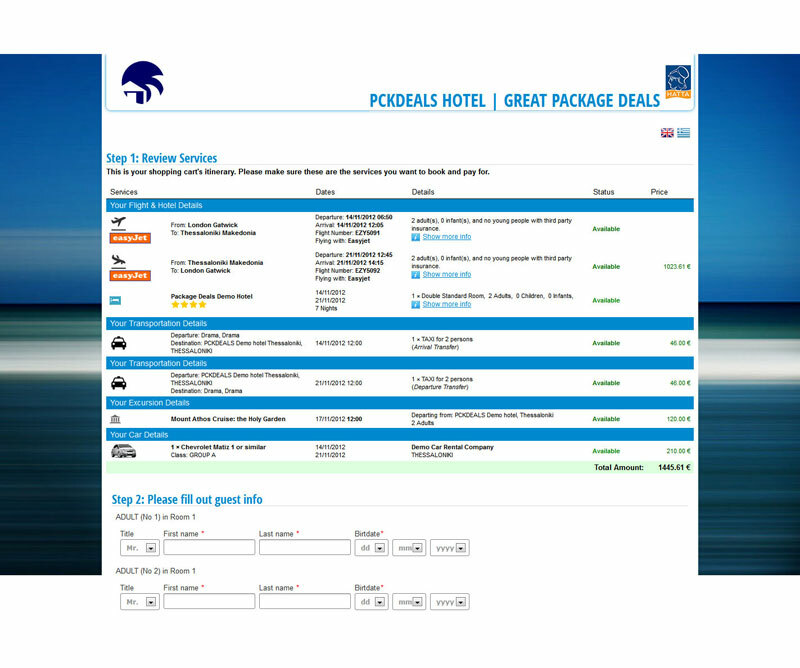 While adding the extra services the new value of the package is automatically recalculated, and the booking is completed in just three steps. The payment of the reservation is enabled in various ways, such as cash on delivery or usage of a credit card, by paying a deposit or the full amount. Afterwards the booking and the payment there is ability for issuing and printing on the relevant vouchers (reservation voucher, invoices, etc. ).